Agnolotti is a type of pasta typical of the Piedmont region of Italy, made with small pieces of flattened pasta dough, folded over with a roast beef meat and vegetable stuffing. Agnolotti is the plural form of the Italian word agnolotto. The origin of the name may come from the name 'Angelot' from Montferrat, who is said to be the inventor of the recipe, or from the Latin word 'anellus', which refers to the ring-shaped material within the pasta, per 'The Word Origin Calendar 2009' compiled by Gregory McNamee and published by Accord Publishing. Although their primitive shape was circular, traditionally agnolotti are of a square shape, side of about 1 inch. However, they can also be of a rectangular smaller shape when they are called 'Agnolotti al Plin'. 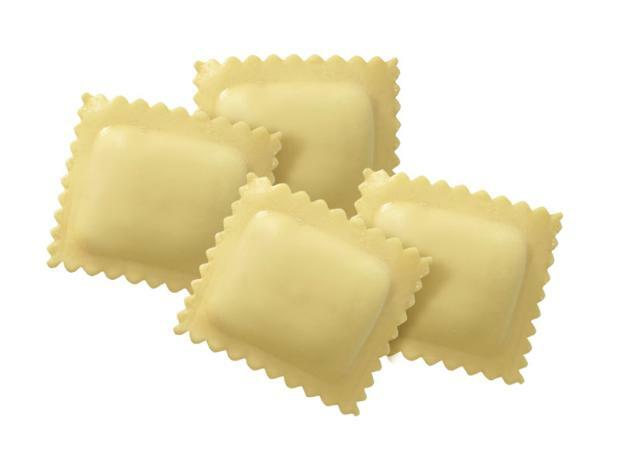 'Plin' means a 'pinch' ( Also see ) because you pinch with thumb and forefinger between each mound of filling to close and seal the little pasta packets. Agnolotti al Plin are almost always made by hand and are typical of Langhe and Monferrato. Agnolotti are prepared by immersion in boiling water. Typically, they are dressed in a beef broth and a little melted butter or in a fresh sage and melted butter sauce, as a complex sauce would detract from the flavours in the agnolotti pockets. In both cases topped with Parmigiano Reggiano cheese but no cheese resides in the agnolotti. The dish is associated with Piedmont in Italy and is not to be confused with Parma's stuffed pasta pockets called 'Anolini'. Similar recipes with different stuffing without meat (e.g., ricotta cheese and spinach) are not properly agnolotti but ravioli. Recipes using Agnolotti see Here and Here.